The book database used by this website is maintained by the Independent Booksellers Association. Therefore information concerning the availability of some titles may be inaccurate. For current information on what Hearthside Books has in stock please call or email. Kim Rich was an ordinary girl trapped in an extraordinary childhood, someone who dreamed of going to parties and getting good grades while living in an after-hours hell of pimps and con men. Kim Rich longed for normalcy, yet she was inescapably her father's child, and she had no choice but to grow up fast. 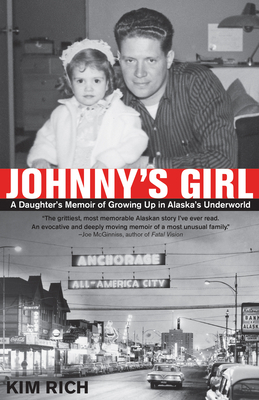 Her mother was a stripper and B-girl: her father was a major player in the underworld of Anchorage, Alaska in the sixties, a city flush with newfound oil money. Only after her father was gruesomely murdered and Kim became a journalist was she able to fill in the missing pieces of one American dream gone horribly wrong. Kim's true story is a tale of a woman's search for her parent's secrets. What she finds is both shocking and tragic, but in the end she's able to discover her true self amid the remnants of her parents' lost lives. Born in Hollywood, raised in Anchorage, Alaska and with an MFA degree in writing from Columbia University, Kim M. Rich has taught at Alaska Pacific University. She now lives in the lower 48, outside of Alaska. "The grittiest, most memorable Alaskan story I've ever read. An evocative and deeply moving memoir of a most unusual family." 10 books gets you 40% off the book of your choice! Start your card today at either store.